Palmistry has a long history, originating in the East, with writings on palmistry found from India, China, Japan, and Korea. It dates back approximately 5,000 years ago, according to The Palmistry Bible, by Jane Struthers. It was slow to spread to the West but gained momentum around the 19th century when many people developed an interest in spirituality and the occult. You can’t hide your true character from a palmist, as long as he or she can see your hands. Palmistry uses the size and shape of the hand (chirognomy), as well as the lines on the palms (chiromancy) to determine a persons character and personality traits, as well as some information about events in that person’s life. But it’s not just something you learn in order to evaluate others. You can also use it to learn about yourself, where your limitations and strengths lie, and about the events that affected or will affect you, allowing you to make more informed decisions about the paths you wish to take. Palmistry complements astrology, as I found out when I spoke with Alan Annand, Vedic Astrologer and Palmist, who sees clients at his home office in Toronto, as well as teaches classes there. Annand has been using palmistry to enhance his consultations with his clients for approximately ten years and splits the consultations into 80% astrology and 20% palmistry. Can You Use Palmistry to Predict the Future? In the past, palm reading has been associated with fortune telling, but when asked if palmistry can be used to predict the future, Annand is hesitant to say that it can and says that he doesn’t try to do that. He talks about timelines in the hand on certain lines, such as the lifeline, and explains that there is some ability to talk about things that can happen at various ages in a person’s life. Most times he says he doesn’t use palmistry to do that. 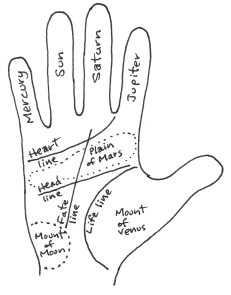 If one does not have astrology as the tool for prediction, The Palmistry Bible does discuss the possibility of using the lines in the hand to predict problems that lie ahead, which would allow you to avoid them. The book also suggests that lines on the hand will change as the future alters from actions taken. Does the Length of the Lifeline Indicate How Long You Will Live? The lifeline begins between the thumb and the index finger and curves around the base of the thumb. Many people think that the length of the lifeline can be used to predict lifespan, but in actuality, this is not the case. The Palmistry Bible stresses that the quality of the lifeline is more important than the length of the lifeline, as it indicates physical energy. A strong but short lifeline could indicate a longer life than one that is long but weak and broken. Palmistry fascinates because it reveals personality traits and tells us things about ourselves even when we’d rather keep those things hidden. It displays a road map of the past, illustrates the present, and hints at the future. Anyone working on self-awareness and personal growth would find it worthwhile to have his or her palm read. The information from a palm reading will provide insights into your personality that you can use immediately. If you learn to read palms yourself, then you will have valuable skills that can help you in any interactions you have with others, including in business. Annand, Alan. Navamsa (Accessed April 27, 2011). Struthers, Jane. The Palmistry Bible: The Definitive Guide to Hand Reading, New York: Sterling, 2005.